During three spring seasons between 2006 and 2008, Kazuyo Sejima and Ryue Nishizawa taught at the School of Architecture at Princeton. 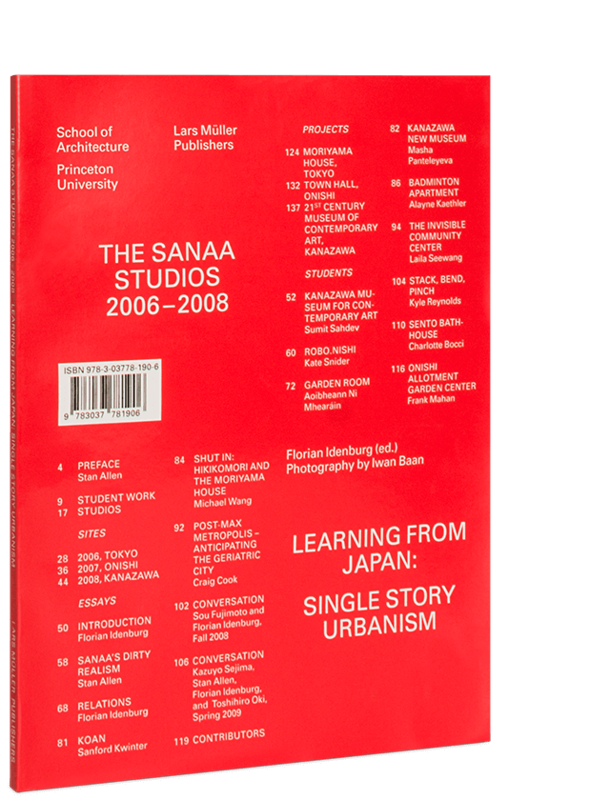 The SANAA Studios explored Japan's contemporary society as a context for architecture and considered its particular perspective on space, the personal and the public realm. Design exercises were situated within the specific demographics and social variables of three distinct sites in Japan. This book forms an attempt to capture the atmosphere in which the studios were conducted and register some of the findings gained out of exploring the office, its methods and its context. As an overall thematic it asks: What can we learn from SANAA? It tries to frame SANAA’s compassionate search for new architectures within a larger societal context. It combines analyses, essays, documentary, design proposals and “objets trouvé” within one book. For this publication, Iwan Baan, Dutch architectural photographer, has revisited the 3 sites where the studios took place to capture the spirit of its context and the SANAA buildings in use.